"Hot Air Balloon over Napa Valley"
This queen-sized quilt, depicting a hot air balloon soaring over the vineyards of the Napa Valley, will look absolutely outstanding in your bedroom! This is a one-of-a-kind quilt; you'll never find another one like it any place. This quilt has been lovingly and carefully constructed with 100% cotton fabrics by a skilled quilter in Walnut Creek, CA. It will last you a lifetime and wrap your family in love. This is a unique, hand-crafted quilt with an original design. The top was machine-pieced and the quilting was done on a hand-guided longarm quilting machine. 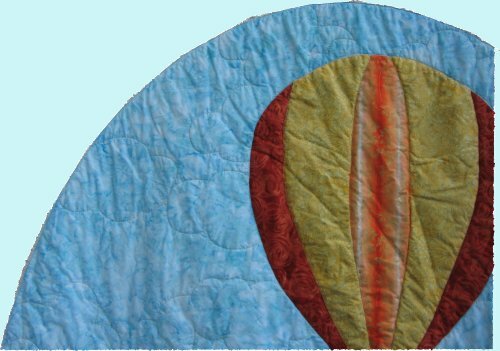 The hot air balloon is machine-appliqued to the blue sky background. Underneath the hot air balloon is an extra layer of batting so that the balloon itself has extra dimension and loft. The green vineyards are pieced together and machine-appliqued. 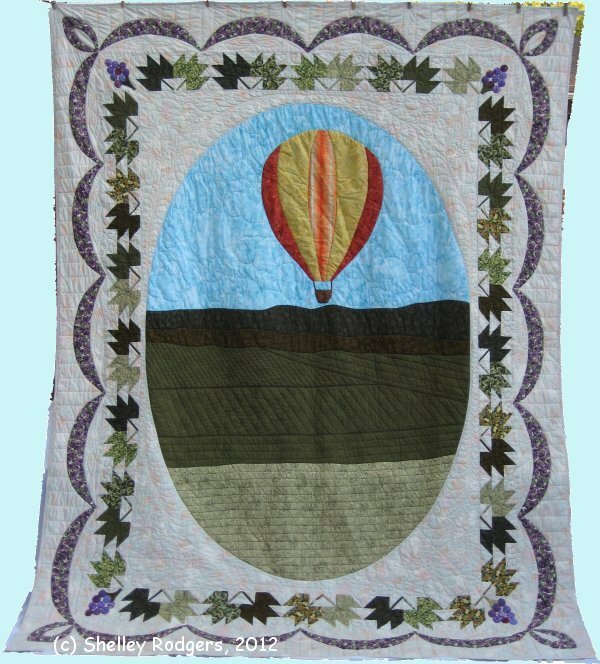 An oval frame of a mottled, pastel background fabric was created and then laid on top of the hot air balloon and vineyards and machine-appliqued in place. 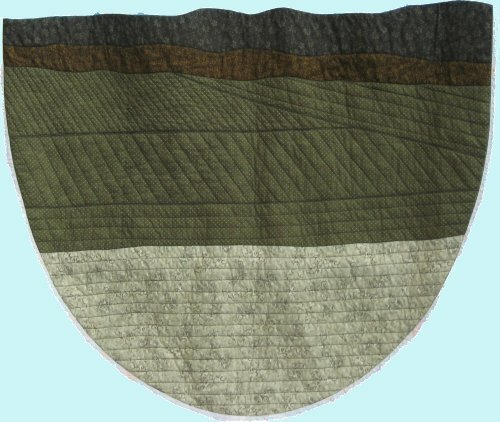 The grape leaf border that surrounds the hot air balloon are machine-pieced. Many different shades of green fabrics were used to create the leaf blocks. 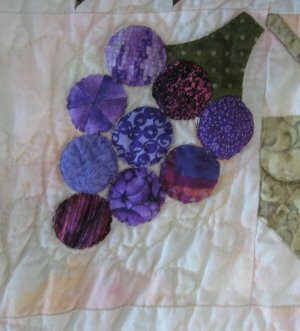 The cornerstones are machine-appliqued grape clusters, which consist of nine individually created circles of various shades of purple. The swags of the final, outer border were made from grape-motif fabric and were also machine-appliqued to the background fabric. All of the quilting was done on a longarm quilting machine and was hand-guided, using a combination of ruler-work and free-motion quilting. None of the quilting was done by any computer-aided process. 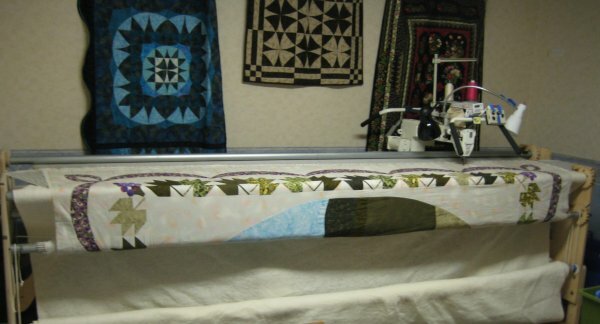 You can see how the quilt is "loaded" onto my longarm quilting machine. Clouds surround the hot air balloon. Here you can see the different sections of the vineyards below the hot air balloon. Curling feather plumes surround the oval frame. Feathers are a very popular and attractive quilting motif. There are lines to define the grape leaves and curling tendrils escape between them. 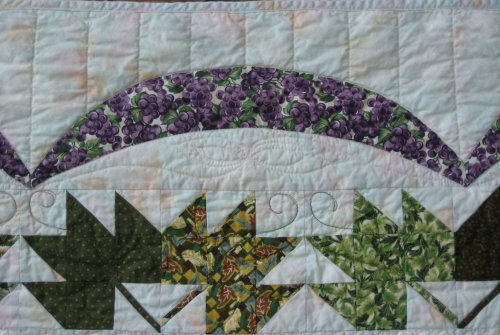 A "piano key" border is quilted outside the swags. There is outline stitching around each of the grape swags and the corner grape clusters to produce a slightly "puffy" effect. A custom machine-embroidered label is permanently attached to the back of the quilt. The batting is the preferred combination of 80% cotton and 20% polyester. This batting is non-allergenic and provides a beautiful drape to the quilt. 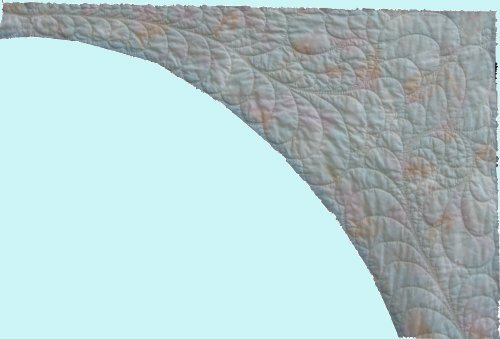 The back of the quilt is a traditional, non-bleached muslin. This quilt is a queen-sized quilt but could also be used on a full/double bed. This quilt has been laundered so that you can be assured that is it ready to use and no shrinkage will occur. You will find that as this quilt is laundered, the softer and more "drapey" it will become. It is sure to become a family heirloom and will provide many years of love and warmth. 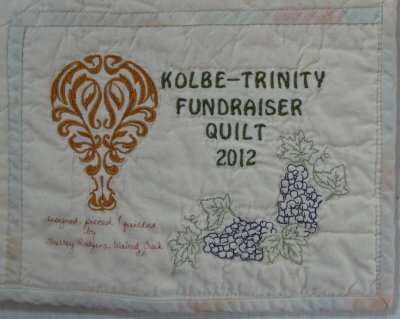 Designed, constructed and quilted by Shelley Rodgers, Walnut Creek, CA, who can be reached at pirate@value.net.